NASA’s Juno probe continues to beam back stunning pictures of Jupiter and its turbulent atmosphere. 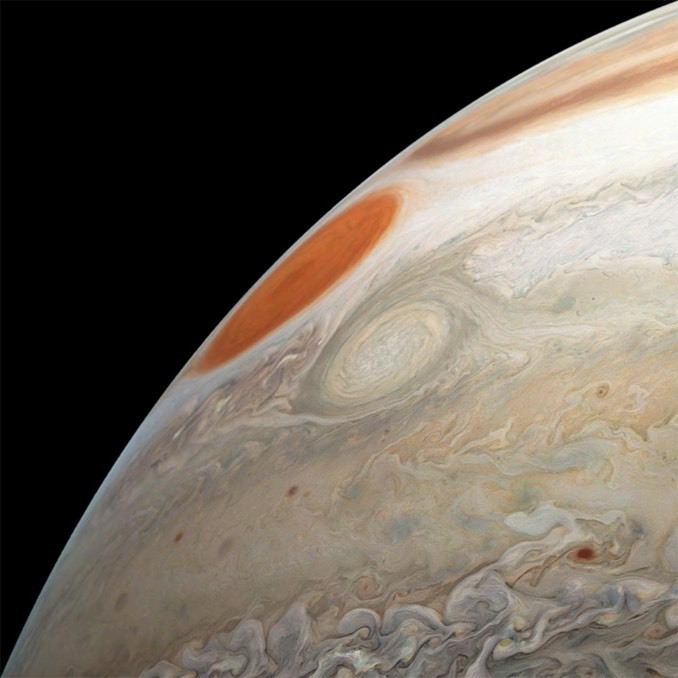 One of the latest shows the Great Red Spot in an image captured 21 December during the spacecraft’s most recent close approach. The photo also shows another large storm, dubbed Oval BA, that reached its current size when three smaller storms collided and merged together in 2000. Oval BA has changed shape over the years and changed from reddish brown to a more uniform white, according to NASA. This colour view is made up of three images captured when Juno was between about 23,800 miles to 34,500 miles above Jupiter’s cloud tops. 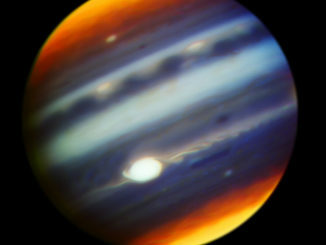 The image was processed by citizen-scientists Gerald Eichstädt and Seán Doran. 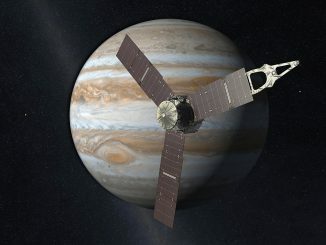 Some of the world’s leading amateur and professional astronomers are meeting on 12-13 May to prepare for a campaign of ground-based global observations in support of NASA’s Juno mission to Jupiter. Delegates from 13 countries in Europe and around the world are meeting at the Observatoire de la Côte d’Azur in Nice, France. In recent nights, observers in the UK and Western Europe have seen the International Space Station (ISS) as a bright naked-eye ‘star’ moving slowly across the sky from west to east. 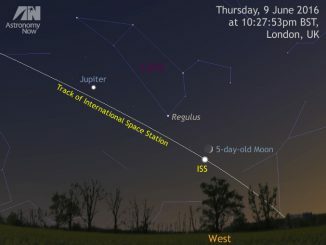 On Thursday, 9 June, London is favoured for some close approaches of the ISS to the Moon, Jupiter and Saturn. If you see the Station, spare a thought for Tim Peake and the Expedition 47 crew on board! Telescopes in Hawaii have obtained new images of Jupiter and its Great Red Spot, which will assist the first-ever close-up study of the Great Red Spot, planned for July 10.